Ce riad a su garder son côté traditionnel tout en apportant tout le confort moderne! 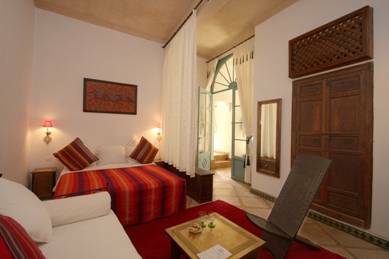 Experience the authenticity of a stay in Marrakech freely in the heart of the Medina of Marrakech, in a riad renovated in the purest tradition and the respect of builders from Fez, nestled in an alley in 2min Museum of Marrakech, where blends beauty and comfort, tradition and modernity. Choose the magic and beauty of a guesthouse where serenity and quality of the home will help your expatriation to the heart of the Medina. Choose the magic and beauty of a guesthouse where serenity and quality of the home will help your expatriation to the heart of the Medina. From the terrace patio, through the 6 rooms and junior suites, Riad architecture allows everyone to hide or blend into the convivial setting of which is, according to his choice or his mood. The full team, with discretion and availability at all times, strives to make your stay unforgettable and satisfy your desires. 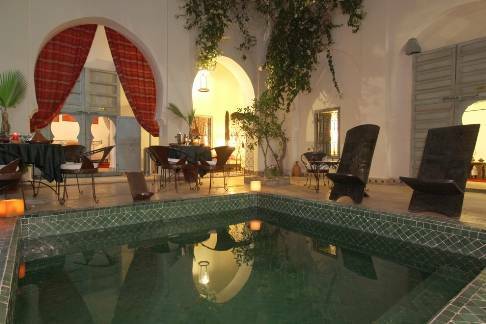 Our guest house is a traditional riad, with a water point in the center that has been replaced here by a pool, and sleeps on the perimeter. 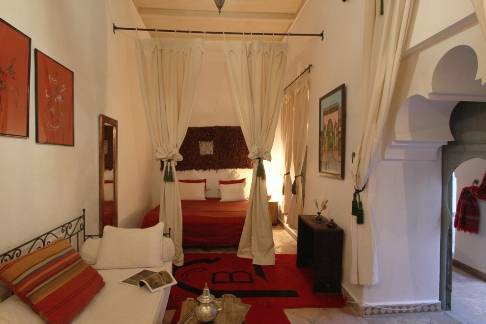 To celebrate the tradition, this riad offers its own hammam. Scrubs, massages and other treatments may be required on site. The patio is raised and is a part of life is highly valued by our guests. 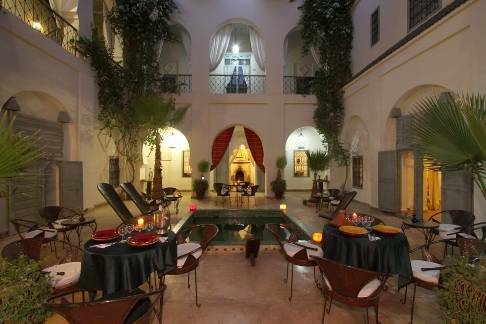 We also have a terrace overlooking the Medina, equipped with a solarium area, a bar, a Berber tent. Airport pickup Breakfast included Childcare or babysitting Children permitted Gay friendly Historic site No curfew Pets allowed Pool (outdoor) Room service Safe deposit box WIFI (free) Our team will be at your disposal to organize if you want an evening in a music-hall lunch in a 'select' a quad or camel to discover the other palm a dinner show Fantasia ... . It can also handle your rental vehicle (car 4x4 scooter electric bike or not ...). We can also organize your transfer airport. " Dining we can prepare your meal in the Riad preferably on demand. Meals are served at your earliest convenience: in the living room - dining on the patio on the terrace view room. As the steam room the scrubs massages all these benefits are starting with a supplement. We have 3 room types: the standard room, superior room and junior suite. With their living room, you have a pleasant space. Satellite TV, air conditioning, safes are available. All our rooms have a bathroom (with shower or bathtub). If necessary, an electric heater may be placed in your room. A hairdryer is available on request. The standard room is located in the patio. Our superior rooms are for the 1st, at the patio and the second on 1st floor. Our junior suites are located on 1st floor. 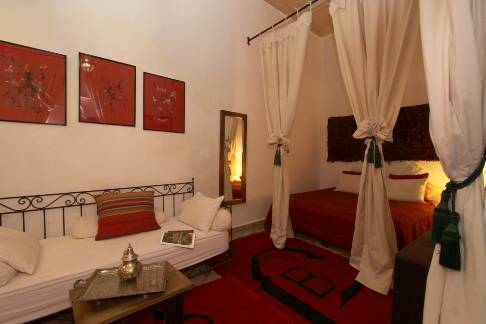 Our riad is located in the Medina of Marrakesh, also called Old Town. Surrounded by ramparts, one enters the gates of Medina by named 'Bab'. To reach the riad, it is better to borrow Bab el Khmis. Very great address. Three floors three very special atmosphere each. 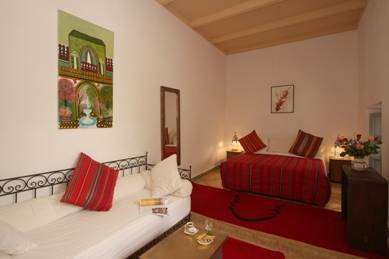 Exceptional setting with stunning views of the Jemaa El Fna. Do you understand the word game?? Kechmara is the slang of Marrakech... Coffee-service restaurant decorated with correct 70's light and relaxed. All changes to a reservation that had already been confirmed, will be subject to new conditions.